To those who celebrate, Happy Day Off! (aka Labor Day.) Even though my mind will be askew for the rest of the week, long weekends are always wonderful. If you follow me on Twitter and Facebook, you may already know about the disappearing site issues I've been having for the last two days. Thank you for your patience, and for putting up with bouts of panic and consistent requests to see if my blog is loading. *xo* I added a 'www' to my address, so I'm hoping this will clear up the problem. Please note that it might take a while for the recipes in the index to load properly (I'm keeping my fingers crossed that I won't have to change things manually). Fiddling around my blog's innards scares me to death. I literally have not slept for more than 6 hours since Saturday, my hair looks like something birds could nest in, and based on my cat's nose twitching, I'm quite smelly. My advice to other bloggers is to save your work, constantly, and to have someone nearby who can console you (and serve you cocktails as needed). Okay, lets talk about happy cake-y things, shall we?! I rediscovered these cake photos in the SD card that I found a few weeks ago. Luckily, seeing photos of food that I've devoured has the same effect as hearing songs, and I'm instantly snapped back to an exact moment in time. This recipe was surprisingly moist and decadent for a coffee cake! Most coffee cakes stray over to the dry side (and they never have enough crumbly topping). Blueberries and cream cheese can fix just about anything. They gave this cake a sweet brightness and an irresistibly suave richness. Sweet & suave...who can resist such an eclectic combo? 6 ounces of cream cheese, softened to room temperature and cut into about 4 pieces. Preheat the oven to 350 F. Butter a 9-inch round spring-form pan. In a small bowl, combine cornstarch with 2 teaspoons of water. Stir and set aside. Place the blueberries and orange juice into a 2-quart saucepan. Bring to a boil over medium heat. As soon as it starts to boil, lower the heat. Stirring occasionally, simmer until the berries have released their juices (about 3 minutes). Stir in the cornstarch/water, and allow the mixture to simmer until it thickens (about 1-2 minutes). Remove the pan from the heat and set it aside to cool to room temperature. In the bowl of a food processor, combine the flour, and 3/4 cup of sugar. Pulse to combine. Add the cold chunks of butter and pulse just until the mixture becomes coarse and crumbly. (Don't over-mix...the dough should not come together.) Set aside 1/2 cup. Place the remaining crumb mixture into a medium-size mixing bowl and stir in the baking powder, baking soda, salt, and lemon zest; Set aside. In a separate large mixing bowl, whisk together the sour cream, vanilla extract, and 1 egg. Add the flour/lemon zest mixture and stir until incorporated. Spread the batter into prepared pan. Cover lightly and set aside as you prepare the topping. Pour the cream cheese mixture over the cake batter. Use an off-set spatula to gently spread the cream cheese over the entire surface, leaving a 1/2-inch bare border. Pour the now-cool blueberry mixture on top of the cream cheese layer and gently spread the berries into an even layer over the cream cheese. If you're using nuts, stir them into the reserved flour mixture. Sprinkle the mixture over the cake (on top of the blueberry layer). Bake for 30-40 minutes, or until cake is golden brown. Remove the cake from the oven and place it on a cooling rack. Let it cool for about 20-30 minutes before releasing the rim. Allow the cake to come to room temperature before slicing. I love sweet-sweet crumble cakes with unsweetened creamy coffee. It's the perfect pairing! Mmmhh, what a marvelous cake! Really tempting. So glad your site is back, yay! 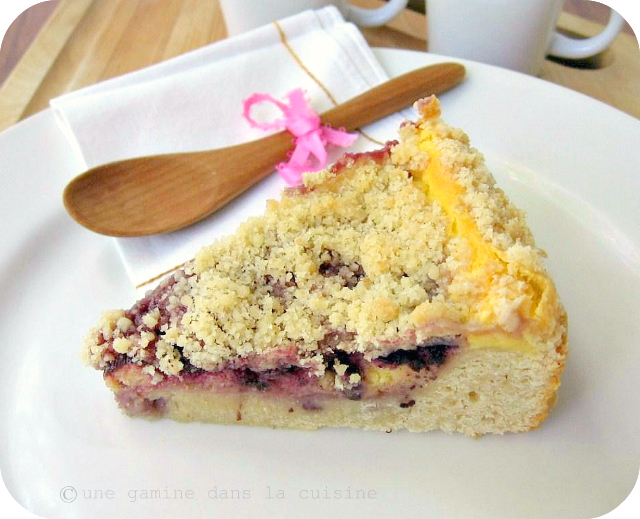 As for this coffee cake, I'm in love with it - I'd like a big wedge with a second cup of coffee please :). Look absolutely awesome! Lovely filling (orange flavour and nuts, delicious!) and pics. How traumatic! Hopefully you've got all your blog issues resolved. I've tried in the past to bak mine up, with no luck, so I cross my fingers and hope for the best. In the meantime, your coffee cake looks like a wonderful consolation. After I left that last comment, I realized I was practically tempting fate to erase my blog. So I kept trying - still couldn't back it up on Safari, but got it to work on Firefox. Thanks for the gentle nudge! I would be a mess too if blog problems arises! I think the solution to that is a bottle of wine and some good chocolate cake. As for this coffee cake - YES PLEAS! I need to make this over the weekend so I can devour this for breakfast before I head off to work! This is a perfect match for coffee. Loved it! I understand that hollow feeling in the pit of the stomach when something goes wrong with our blogs and it seems that anything you touch behind the scenes changes something you didn't expect. Cocktails would help - and this great looking cake. Good luck with your technology issues! Hopefully this cake soothes your worries :) It looks lovely and golden. I love the sound of the richness. Website problems are so stressful, I do not handle them well either. This just looks amazing- so pretty and so delicious looking! I HATE computer problems...and also had one this weekend, too. 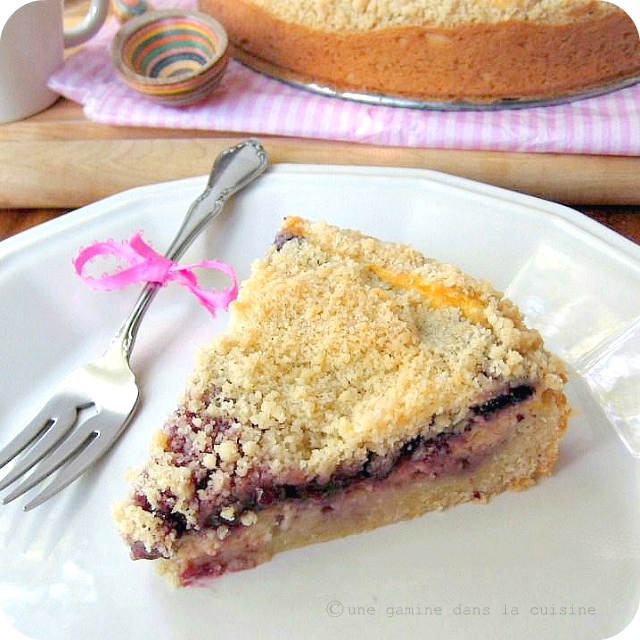 But your fabulous blueberry coffee cake would go a long way to making me feel better! we just recently learned the importance of backing up when we lost everything on our hard drive, ugh it still makes me sad thinking about all the work i lost! ok on to happy things, like this cake! i just love everything about this - the blueberries, the orange juice, the choppped nuts, so many delicious things! cannot wait to try! Streusel! The cake looks spectacular! This coffee cake looks so good. I love a good blueberry/cream cheese combo. This with coffee is my kind of morning! Anything with streusel tempts me! I want a slice of this now! How do you bake all these delightful goodies, day-in and day-out, and still remain so skinny and sane! I would be sugar-crashing!!! But it's all worth it...just a taste of all the sweets, miam-miam! Wow, that doesn't sound like fun. Glad you sorted it all out now. I've never backed up my blog, and I don't even know how to. Got to Google this!